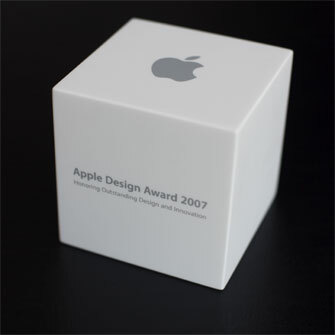 The Apple Design Awards, now in their 12th year, recognise technical excellence and outstanding achievement in Mac OS X software design and development. There are seven categories: Leopard Application, User Experience, Developer Tool, Game, Scientific Computing Solution, Dashboard Widget and Student Product. 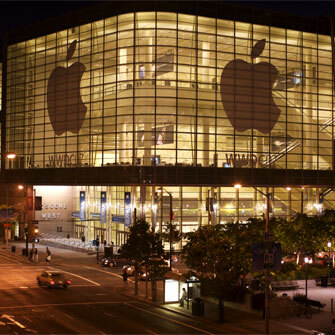 The winners and runners-up in each category were announced at a special awards ceremony at the Apple Worldwide Developers' Conference, held at Moscone West, San Francisco, on Tuesday 12 June 2007. SingleCrystal is a unique program that leverages the outstanding graphics and ease-of-use of Mac OS X to provide an accessible and fun way for students, educators and researchers to understand complex, three-dimensional diffraction patterns from crystals. Although a relatively-specialised program, SingleCrystal provides a key showcase for Mac OS X technologies including fast Quartz graphics, PDF export, QuickTime import/export, Apple Events, Core Foundation XML/HTTP, Help Viewer and of course the full Aqua user experience. 17 September 2004. 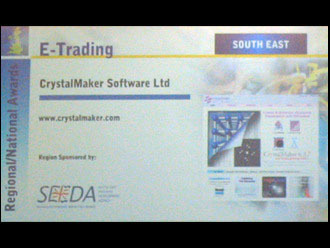 CrystalMaker Software Ltd are delighted to announce that they have won the "eTrading" category of the 2004 South East England eCommerce Awards. The 2004 eTrading Award was presented to Manager Director, Dr David Palmer, by the Enterprise Network Editor of the Sunday Times, David Sumner-Smith, during a gala luncheon at the Arora International, Gatwick. In his award citation, Mr Sumner-Smith praised CrystalMaker Software's success, as a small British company, selling highly-specialized software direct, to a worldwide market - with sales to 33 countries spread across 5 continents and including the world's major universities and research labs. Update, 6 October 2004. As the winner of the eTrading Award for South East England (the UK's largest and most prosperous business economy), CrystalMaker Software Ltd was shortlisted for the National Awards. The regional and national awards winners were celebrated at a gala dinner held in the Grosvenor House Hotel, London, attended by national dignitaries including Mike O'Brien, the UK Minister of State for Energy and e-Commerce. 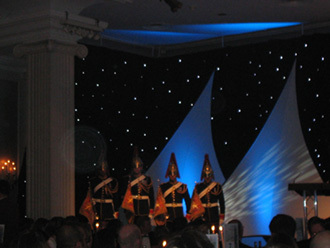 The glittering event was hosted by Bill Turnbull from BBC News 24. The 2004 national E-Commerce Awards are run by the UK Department of Trade and Industry (DTI), and by InterForum, a not for profit membership organisation that helps British businesses	to trade electronically. Sponsored nationally by the Royal Bank of Scotland Group and national media sponsor The Sunday Times Enterprise Network, these awards have been designed to recognise and reward those organisations that have demonstrated excellence through the use of the Internet and other Information & Communications Technologies. The Awards are open to UK businesses (limited or otherwise), public bodies, registered charities and not-for-profit organisations with fewer than 250 employees based in England, Wales, Scotland, Northern Ireland or the Isle of Man. The Awards are run on a regional basis in the following categories, with the regional winner of each category going forward to a national category final: "E-Business Start-up", "E-Business", "E-Trading", "Best use of Broadband", "Best use of Teleworking". The 12 regional winners in each category go forward to be judged at a national level. 11 December 2001. CrystalMaker 5.0 has been selected as a finalist in the prestigious Macworld 2001 Editors' Choice Awards, as one of the best Science/Engineering programs of the year. The Eddy Awards, the Apple Macintosh industry's highest distinction for breakthrough product development, are given to the year's top software and hardware products in 25 categories. The Macworld editors surveyed every Mac product on the market from 1 November 2000 to 1 November 2001, evaluating them for their overall quality, as well as their utility, innovation and elegance. CrystalMaker 5.0 was selected as one of the three best Science/Engineering programs, together with entries from Wolfram Research and Vector Works (the overall section winner). CrystalMaker is a computer program for exploring the complex arrangements of atoms and bonds that define the structures of crystals or molecules. The program is now used by many thousands of scientists worldwide - including major governmental laboratories, corporations and universities. A unique features of CrystalMaker is the ability to create fully-interactive computer models - which can be manipulated on a PC or Mac, without the need for the original program or additional equipment. These "Virtual Reality" models can easily be incorporated into CD-ROM or web-based multimedia. Recent high-profile examples include touchscreen computer exhibits at the Natural History Museum, London, and the Swedish Natural History Museum, in Stockholm.